The Seven Sisters Dreamtime story is an epic tale of lust, love, passion and danger. Artists who paint this Dreaming explain it is the story of an Ancestral Being in the guise of a man who relentlessly pursues seven sisters (Ancestral Women) over land and sky. In hot pursuit, the man travels great distances from Western Australia into the APY Lands, and later the protagonists’ cross-country travels take him into Warlpiri country, where the seven sisters become the Napaljarri-warnu. This epic narrative is explored from the perspective of a number of Indigenous artists here at Kate Owen Gallery, culminating in a collection of works that are as intricate as they are expansive. Andrea Adamson tells us the story of Kungkarrakalpa Tjukurrpa (Seven Sister Dreaming); the seven sisters and their travels through the country as they are pursued by Wati (Man) Nyiru. Nyiru saw the sisters as they travelled to the west. He fell in love with them, and even though they were of the wrong skin name to marry him, he was desperate to make them his. As the women fled from Wati Nyiru they created the country and landscape around Andrea's home, trying to trick him and escape from him. The sisters created the rockhole's, sandhills and rocky outcrops as they tried to escape. Eventually they created a rock hole which went deep under the ground and came up on the other side of the hill. The women dived into the water and came out on the other side to fly up into the sky. Wati Nyiru followed them into the water and when he came out on the other side he was too late. Now, Wati Nyiru can be seen to the south of the seven sisters, as he still chases them across the sky. 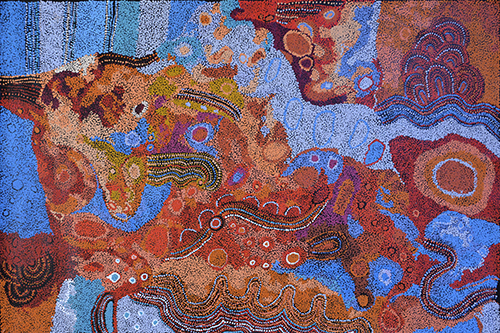 Artists such as Athena Nangala Granites and Gabriella Possum Nungurrayi tell the story of Yanjirlpirri Jukkurpa (Star Dreaming) and/or Napaljarri-wanu Jukurrpa (Seven Sisters Dreaming). Both Dreamings are closely associated with each other; one detailing men’s sacred ceremonies, while the other tells the story from the perspective of the female ancestors. 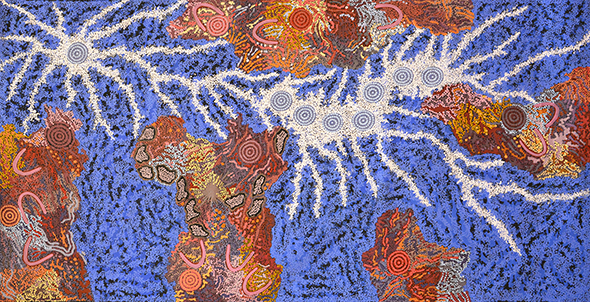 The Napaljarri-wanu Jukurrpa (Seven Sisters Dreaming) depicts the story of the seven ancestral Napaljarri sisters. An ancestral Jakamarra man was in love with the seven Napaljarri sisters and chased them. In a final attempt to escape from the Jakamarra, the sisters turned themselves into fire and ascended to the heavens to become stars. The seven Napaljarri sisters can be found in the night sky today as a cluster of seven stars that is part of the constellation of Taurus (also known as the Pleiades). Jukurra-jukurra (the morning star) is the Jakamarra man, still chasing the Napaljarri sisters across the night sky. Paintings of this Jukurrpa (dreaming) often depict the seven women carrying the Jampijinpa man ‘wardilyka’ (the bush turkey). He is also in love with the sisters and he is the cluster of stars known as Orion’s Belt. The custodians of this dreaming are men from the Japaljarri/Jungarrayi skin group and women from the Napaljarri/Nungarrayi skin group. Yanjirlpirri Jukkurpa (Star Dreaming) tells of the journey of Japaljarri and Jungarrayi men who travelled from Kurlurngalinypa (near Lajaman) to Yanjirlypirri, which is West of Yuendumu. They then travelled on to Lake Mackay on the Western Australian border. Along the way they performed initiation ceremonies - known as ‘kurdiji’- for young men. Women also danced for the ‘kurdiji’. There is a site known as Yanjirlpiri (star) that is still an incredibly important and sacred site. Young boys are brought here to be initiated from as far as Pitjantjatjara country to the south (near the NT and SA border) and Lajamanu to the north (580km South West of Katherine). Yanjirlypiri has a low hill and a water soakage, and when night falls the stars and the land appear inextricably connected. Yanjirlypiri may be depicted in this canvas using traditional iconography. 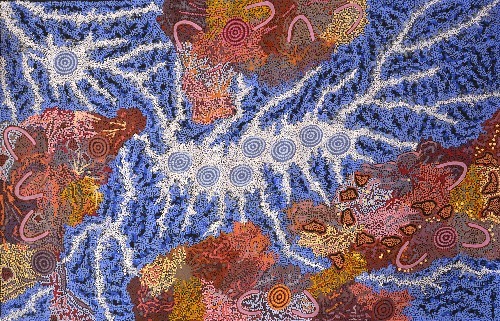 Paintings depicting this Jukkurpa are often accompanied by a representation of the female star Yantarlarangi (also known as Venus – the evening star) who chases the seven Napaljarri sisters for having stolen the night from her.